As you can probably tell it’s a bit bleeding giggy round these parts of late. After last weeks Aromatherapoid and Tiger Translate on Saturday (which was a gas) this week it’s predictably another waft of the Aromatherapy on Thursday followed by Block Party on Friday which promises pungent power of unspeakable proportions. 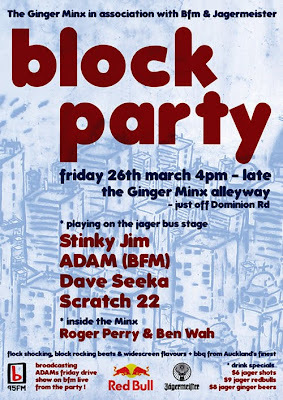 Inside the Minx me old mucker Roger Perry will be playing with Ben Wah while outside A.D.A.M. will be presenting his Friday drive show for 95bFM from 4-7 and then Scratch 22, Dave Seeka and myself will be sending out the shots (sonically) from the Jagermesiter bus/hummer type thing down the alley. The Minx will be sectioned off and there will be an outdoor bar and allsorts, as ever it’s free – so all those people who whinge and whine about paying the equivalent of a beer or two as a cover charge..NO EXCUSES! Tightwads and them living large are all welcome, see you there. 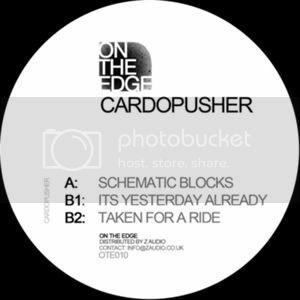 This week have a gander at this track from the new EP by Venezuelan vibes vandal Cardopusher. While he’s best known for his impressive but often merciless drill’n’bass-step kind of maneuvers, and frankly his gear is a cut above almost anyone in that scene, there is always a discernible sense of sophistication and a suggestion of something less abrasive than the mob in his hoo-ha. 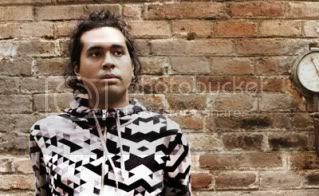 Schematic Blocks his latest for On The Edge realizes that potential and leaves any pavlovian wobble tricks in the cupboard… it’s very very good. Have a listen to this slink number and see if you’re not hooked, then follow the links to purchassification gratification and you are officially away. And don’t forget… Aromatherapy — Thursday…you know it makes scents!